My first line of defense against this addiction, which grows stronger with the accumulation of gray, cold days, are chocolate chips: a heaping cup added to whatever muffin batter I’m making, a generous scoop at the bottom of a cup of steaming milk, and (when desperate) morsels by the mouthful. 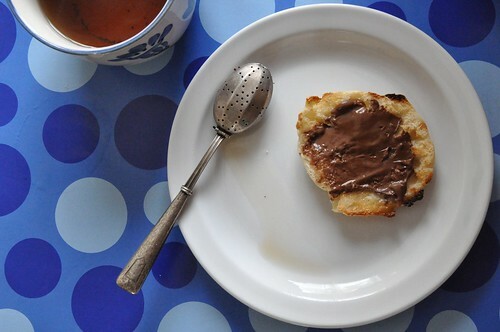 Second in my arsenal is Nutella on an English muffin, a cup of strong tea on the side. I like my muffins crispy at the edges, butter pooling in the cracks and crevices and topped with a slather of the chocolate-hazelnut spread. After making and munching two of them in five minutes, I’ve found the fortitude to deal with the dregs of a busy weekend.